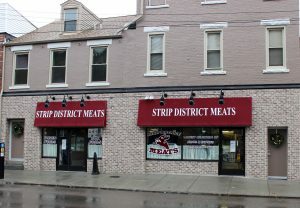 Strip District Meats is a nostalgic treat, reminding you of the butcher shops of a bygone era. Its a visual delight thanks to head butcher Raymond Turkas’ artistic inclinations who studied art and sculpture at Carnegie Mellon for a year and arranges rows of pork chops, chicken, yards of homemade sausage, steaks and ribs into visions of wonderful meals. We carry a full line of beef, pork and chicken. The shop offers rabbit, quail, pheasant, duck and goose, which are available frozen. We also offer the popular flank steaks, hanger steaks, flat iron steaks and skirt steaks for the grill. Strip District Meats offers tongue, sweetbreads, and brains for the adventurous pallets. And for the gastronomic risk takers, mountain oysters, the euphemism for bull testicles. The list of exotic specialty products is endless, anything you can imagine we probably carry, and if we don’t we can get it for you. Check out our exotic and specialty sections.